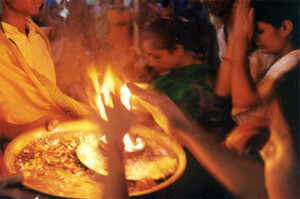 There are different systems, modes and procedures of darshan, for ritual prayers and ritual offerings. Although we could offer general information, we find it more useful to take inquiries in order to determine the services and information that will best correspond to your needs. Every situation is different, and individual customs vary. Thus it is important for us to know and clearly understand the intentions, objectives, and desires of those seeking assistance (whether it be an individual devotee, a group, or family of devotees/visitors). This way we can provide assistance that is useful, precise, realistic, and applicable to your particular situation. Therefore, we request you to contact us using the mobile numbers and email ID given bellow for discussing the issues and subjects related to darshan, ritual prayer, ritual offering, etc. before visiting the Kamakhya Temples’ Complex. We will try to make sure that, you get a smooth, satisfactory, blissful and memorable experience.